Skin inflammation is a sign of toxins inside the body, and in cases of serious skin problems, external treatments with creams may not be enough. A better approach to acne and other skin issues is to detoxify your body to expel these toxins from the inside and prevent further outbreaks. The major cause of acne is believed to be hormonal turbulence and this formula was created to balance hormones. It has been useful in improving blood circulation, which can help to nourish skin that has been damaged by acne and prevents recurrence. This herbal combination is used to treat abscesses, acne, blood purification, cold sores, disinfectant, psoriasis, eczema, ringworm, shingles, skin disorders, skin eruptions and tumors. Aside from herbal, or conventional treatments, there are other ways to help heal and maintain healthy skin, such as stress management is important and a healthy diet of fruits and vegetables that provide nutrients for the skin. Some items you should steer away from (to avoid aggravating acne) are alcohol, coffee, spicy food, lamb, mango, pineapple, chocolate, sugary and greasy foods. Yellow Dock (Rumex crispus), is an effective herb for the treatment of acne and dermatitis conditions. Yellow Dock mobilizes congested blood and yanks toxins from the body's tissues, which makes this herbal remedy very useful for treating skin conditions. It is used to cleanse the system of toxic wastes and to help relieve virtually all disorders associated with impurities in the blood. Normally, Yellow Dock is blended with other cleansing herbs, like Burdock and Goldenseal to eliminate toxins and foreign substances that can overburden the liver, the herb is quite useful for treating a wide range of ailments. By significantly reducing the toxic content in the body it becomes easier to heal acne, boils, eczema, psoriasis, hives, dermatitis, as well as fungal infections and blood disorders. Yellow Dock tincture used to aid digestion and its laxative effects promote colon health, easing constipation, clearing bodily wastes and improving skin eruptions caused by the condition. Moreover, Yellow Dock extract's rich iron content helps to enrich blood quality, more than any other plant, as well as varying amounts of vitamins and minerals. Together these blood cleansing herbs will help nourish kidneys, spleen and liver, balance minerals and salts, strengthen red and white blood cells, clear out the harmful acids and calcification that lead to arthritis, and filter out bacterial and viral infections that can cause skin eruptions. Medicinally, Burdock Root (Arcticum lappa), is used internally and externally and is thought to be one of the most important for treating all forms of chronic skin problems, such as eczema and psoriasis, among others. The herb yields particular benefits on eruptive and inflamed pimples, boils and abscesses. Burdock Root tinctures remove toxins from the body that are often associated with skin ailments, and it is believed to remove the inflammation. Burdock Root extract is one of the foremost cleansing herbs, providing nourishing support for the blood, the liver, and the body's natural defense system, as well as being rich in vitamins and minerals. Due to its ability to reduce inflammation, some research also evaluated the benefits of using Burdock for allergies as well as, atopic dermatitis, a chronic allergic condition, and dandruff. Also due to the anti-inflammatory properties, it has been used to treat varying forms of arthritis. Burdock extract is also considered an antimicrobial and has been combined with vitamin C supplements may help to clear up antibiotic-resistant and stubborn staph infections. Black Walnut Hulls (Juglans nigra) are prescribed by herbalists as it offers many medicinal uses and benefits, as an antiseptic, germicide, anti-parasitic and a laxative. Black Walnut Hull tinctures contain large amounts of tannins, which are responsible for helping to destroy intestinal parasites and normalize skin conditions. Because of its high content of organic iodine it has been shown to be an excellent antiseptic for healing. Black Walnut extract is said to be very beneficial for clearing up acne and poison ivy, boils, carbuncles, cold sores, impetigo sores, exudative diathesis, warts, atopic dermatitis, eczema, skin irritations or rashes and shingles. Thrush, jock itch, athlete's foot, and vaginal yeast infections are all caused by Candida, can be cleared up with daily use of this herbal tincture. Goldenseal root (Hydrastis canadensis) is a bitter, contains the active compound berberine, and is used to stimulate the secretion of bile and has shown strong activity against a variety of bacteria, protozoa, yeast, and fungi, such as E.coli and Candida. Many researchers believe that berberine may also be capable of activating white blood cells, making them more capable of fighting off infection. 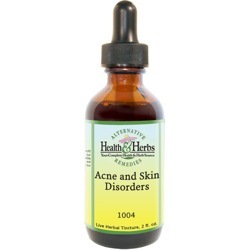 It has also been taken internally as an herbal tincture or used topically in a face wash or mask to treat acne. Herbalists often recommend it for its anti-inflammatory, antiseptic and antifungal properties and found to be useful in the treatment of hemorrhoids, abscesses, carbuncles, boils, giardia, canker sores, ringworm, vaginal irritation and athlete's foot and other fungal infections. Goldenseal extracts have been used effectively to provide relief from inflammations such as eczema, psoriasis, herpes sores, conjunctivitis, and blepharitis. Goldenseal's alkaline compounds apparently have antibiotic properties which are thought to be effective in treating digestive problems, UTI's, and for healing wounds. Valerian root (Valeriana officinalis) dates back thousands of years with a traditional belief in the herbs' ability to heal skin disorders like those displayed during an attack of HSV and acne. It benefits the skin by minimizing irritation from rashes, pimples, and cold sores.Valerian root extract has been helpful in treating chronic conditions, such as rheumatism and eczema, slow healing skin infections, such as abscesses and ulcers.Valerian tincture is excellent for use against nervous disorders, palpitations, multiple sclerosis, vertigo, epilepsy, sciatica, neuralgia and muscle spasms.Valerian Root has a grounding, calming and relaxing effect on the body. Pau d'Arco (Tabebuia impetiginosa) is a powerful herb for the treatment of acne, and it has been used for thousands of years for just about every condition you can imagine. Research has shown Pau d'Arco to be an anti-inflammatory, antioxidant, antiviral, anticoagulant and antimalarial. It contains bitter compounds that have anti-tumor activity, especially for certain blood and skin cancers. There is some evidence that some cancers are caused by viruses and Pau d'Arco has been promoted as a cure for viral infections, for strengthening the immune system, flushing toxins from the body, protecting against cardiovascular disease and high blood pressure. Proponents of Pau d'Arco tinctures claim that, when taken internally, it may treat lupus, eczema, ulcers, osteomyelitis, arthritis, Parkinson's disease, malaria and sleeping sickness. It has also been useful as an antifungal to help in the elimination of yeast or Candida, not only from the skin but for candidiasis, the common vaginal infection and thrush. It has a similar action against parasites, fungus, and bacteria. Pau d'Arco has been used to support detoxification and it is an excellent blood purifier, which is good for the skin. It is also effective for constipation and other digestive issues. Sassafras (Sassafras officinale) helps to cleanse the liver and blood, which helps to alleviate internally caused skin ailments such as acne, eczema, psoriasis and other problems that affect the skin. In fact, it has been known as a spring tonic, blood purifier, and blood thinner. Sassafras extracts work with the body to support its own natural inclination to eliminate waste and toxins from the system. The compounds present in Sassafras tincture provide good botanical support for healthier blood and skin, including non-cystic acne. It supports healthy kidneys, bladder, and overall genitourinary tract health, as well as healthy muscles and joints. Echinacea purpurea contains many beneficial constituents for the protection of skin from oxidative stress and it improves hydration in the skin. It also contains substances that stimulate the immune system, reduces inflammation, strengthens blood vessels, increases white blood cell activity, stimulates the body's production of interferon, and protects the skin from sun damage. Its antibiotic and detoxifying properties are of special interest to acne sufferers. Taking Echinacea in combination with Goldenseal may reduce the number of propionibacterium in the skin and reduces the number of acne lesions and blemish outbreaks. It enhances the immune system which helps fight infections, and one of Echinacea's chemical properties is not only thought to repel germs that cause skin conditions but it also stimulates skin cell repair. Echinacea tincture has been an effective treatment for eczema, psoriasis, carbuncles, boils, wounds and plant poisoning (i.e. poison ivy and poison oak). Plantain leaf (Plantago major) included in the combination as a general detoxifier and for soothing inflamed and supporting skin healing. Medicinally, Plantain can provide an alternative herbal remedy for conditions and illnesses ranging from bee stings to bronchitis to kidney stones. Chemicals and vitamins found in Plantain tinctures include beta-carotene (vitamin A), allantoin, calcium, vitamin K, vitamin B1, riboflavin, ascorbic acid (vitamin C), sorbitol, tannin, apigenin, aucubin, linoleic acid, oleanolic acid and baicalein. Each of these constituents together is what has given Plantain leaf antimicrobial, astringent, antiviral, anti-inflammatory, antitussive, diuretic and antihemorrhagic actions. Acubin found in the herbal extract serves as a powerful antitoxin, while allantoin promotes skin and wound healing by speeding up cell regeneration and skin-softening effects. It has been most commonly used in the treatment of acne, skin eruptions, ulcers, blisters, tumors, hemorrhoids and skin disorders such as rashes, eczema, and psoriasis. Chickweed leaf (Stellaria media) is renowned for its ability to cool redness and to speed healing for internal and external flare-ups of the skin. Chickweed, as it name implies, is a weed, and is one of the great green weeds of the world, packed with antioxidants, nutrients, amino acids, vitamins, and minerals. Like Garlic and Cayenne, this herb is excellent for the blood vessels and your circulatory system. Chickweed extract purifies the blood and carries out the toxins that cause skin eruptions. It is an excellent remedy for adolescent acne, sores, rashes, eczema, and psoriasis, cooling and relieving inflamed areas. As a diuretic, Chickweed tinctures can be a valuable friend to those who struggle with heart problems or obesity. Because this herb also reduces inflammation in the body, it also reduces pain. In fact, studies have shown that Chickweed leaf extract can react in the body like an antihistamine to reduce pressure and pain in the body caused by infections or allergies. Garlic bulb (Allium sativa) is nature's most potent weapon against germs and the first line of defense in for fighting infections and a great natural acne cure. Garlic has proven antibacterial properties and an antiseptic effect makes the extract very popular in treating pores and skin infections, as well as acne scars. Well known to have powerful antibiotic properties, and for being a good general blood cleanser, Garlic bulb extracts may help to clean out your system internally and reduce acne symptoms and acne outbreaks. Garlic selectively destroys harmful, or bad, organisms, leaving the good ones untouched and actually promotes good bacteria to fight it. Garlic bulb tincture has been shown to regulate the overgrowth of yeast, or candida albicans, in the body and to destroy viral infections such as chicken pox, measles, mumps, rabies and scarlet fever. Astragalus root (Astragalus membranaceus) is a popular TCM to treat various ailments including, skin, liver kidney, lung and heart diseases. Today, Astragalus tinctures are widely used clinically to prevent and treat diabetic wounds, diabetic nephropathy, psoriasis, cancers, immune disorders and upper respiratory tract infections. The active constituents of Astragalus root extracts consist of polysaccharides and flavonoids. Astragalus also has numerous amino acids and trace elements and recent studies revealed that it contains a large amount of triterpene saponins that have potent antibacterial, anti-inflammatory and immunomodulatory properties. Unlike other skin care ingredients, its antioxidant and healing properties will boost repair and renewal of damaged skin, killing acne-causing bacteria and prevent new lesions from appearing. If you have acne or a ruddy complexion with blood impurities, Astragalus will bring them and blemishes more quickly to the surface. As an anti-inflammatory, it can lessen the chance of developing inflammation and infection in the pores of the skin, and reduce the swelling and redness of existing pimples. Astragalus root boosts the immune system and may help to reduce the risk of a person becoming ill with a bacterial or viral infection. Its antioxidant effects inhibit free radical production, repairing damaged skin cells and helping to stave off some of the signs and symptoms associated with aging. Non-Alcohol: Black Walnut Hulls, Burdock Root, Yellow Dock Root, Golden Seal Root, Valerian Root, Pau d'Arco Bark, Sassafras Root, Echinacea Root, Plantain Leaf, Chickweed Leaf, Garlic Bulb, Astragalus Root, Structured Water and Vegetable Glycerin. Instructions: Use 6-24 drops in water or herbal tea. May be taken 3 times daily. Shake well. Store in a cool, dry place. Keep out of reach of children. From CATHERINE GEDEON of Campbellton, New Brunswick on 11/26/2016 . From Kaya Hyslop of Totnes, , United Kingdom on 9/4/2015 .